I spent the better part of two weeks in Texas. 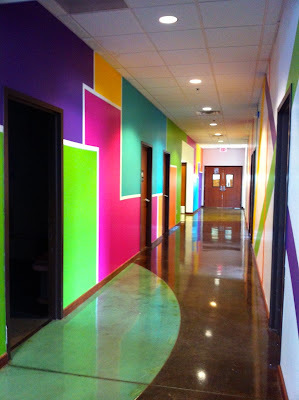 A good bit of that time was spent with Ashley, working on a painting job at Highridge Church in Ft. Worth. Ashley is a designer and we have a business together called My Brush Design. Ashley had done a series of drawings to present to the church to redo their children's ministry area. Now, I know I am her mother, but seriously, she is a genuis :-) Her drawings were phenomenal - but the true excitement was seeing those drawings come to life over the 6 days that we painted together. We started out painting about 1800 square feet of wall space, white. Yes - white. It took us two days to get that done and another day to get it all taped off for the design. It took a lot of prep work - a lot of patience and a lot of perseverance. 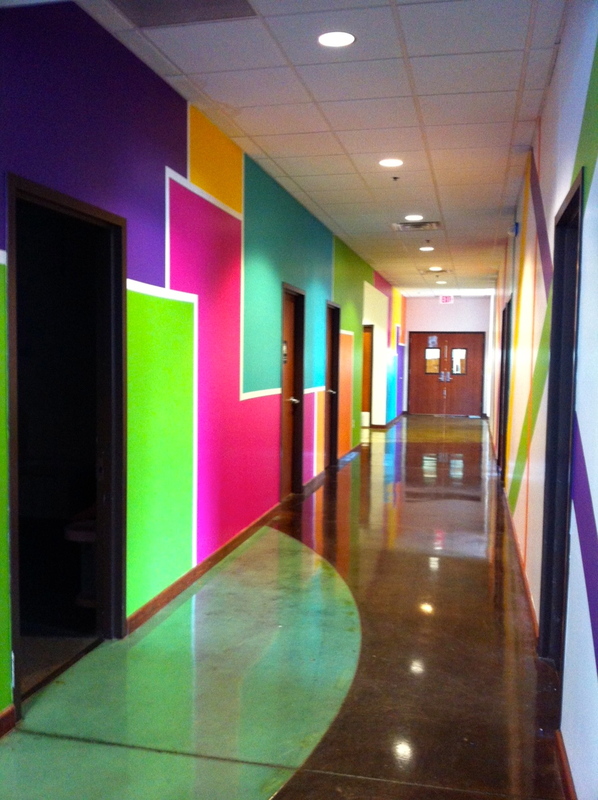 As you might imagine, all the hard work truly paid off when the color began to go on the walls. It was so much fun to see this design come to life. This area went from a dark, rather unexciting hallway to a bright, fun, energizing space. This is the starburst wall behind the check in desk. Signage for the children's ministry will go in that white circle. One side of the wall is solid, geometric shapes. 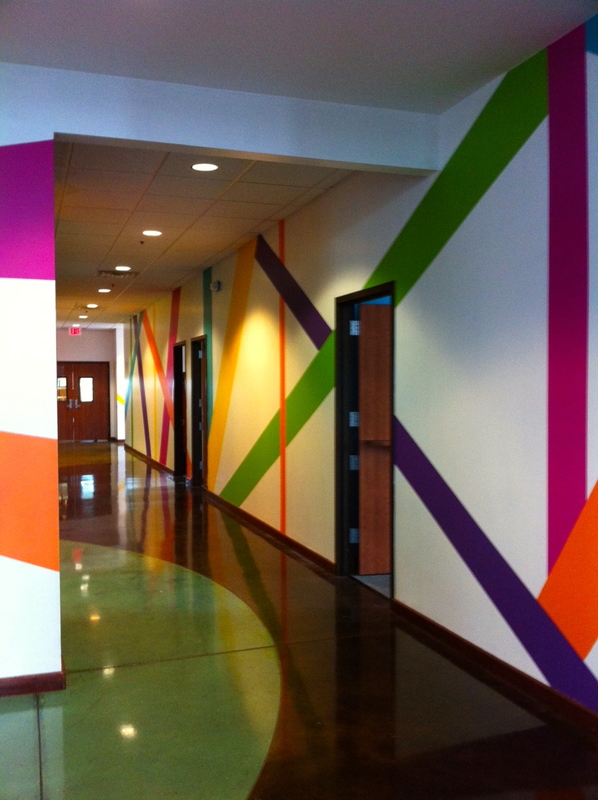 The other side of the hallway has diagonal and vertical stripes. This helps you to see part of the process. Lots of measuring, lots of taping and a 12 foot high wall. We were really thankful for the lift to help on the high parts. YAY! The wall of squares was finished! We were so excited to see this come to life. Like so many things in life, this job was such a picture of the spiritual processes in our lives. It took a lot of planning and preparation. Spiritual maturity is not going to just "happen". You have to be intentional about making the time and making a plan to spend time with God and to involve yourself with a Christian community. It took patience and perseverance. Growing in our faith takes both. We have to be patient with ourselves, patient with God's timing and we have to persevere like no other. I have to say that parts of this job were just tedious, but our perseverance paid off in the end. Sometimes those little things that we have to do and need to do bog us down. Keep your eyes on the goal ahead. It's worth it. The designer knew all along how this would come out. Ashley had a vision and she put together the steps to make it happen. Jesus has a vision for your life. He is transforming you step by step into His own image. He is the Master Designer. He created you in the womb and He is not giving up on you until you see Him face to face. He will see His vision complete. Everyone benefits from good design. It was so much fun to watch people's reactions during this process. The more we got on the walls, the more excited everyone became. We had lots of hilarious comments from kids. This design will benefit the children's ministry in so many ways. It is a win - win. The same is true in your own life. God's design for you not only gives you the life you were meant to live, but it benefits everyone that is in your life. When you walk according to God's design, He uses your life to love, encourage and testify to others. I am so thankful for the opportunity to paint with Ashley and to see her design come to life.